Obliterating Cal with 38 unanswered points, while No. 4 Texas A&M lost, set No. 5 Washington to move up in the CFP poll. And it also teed up a large to-do Saturday with USC, winner of 5 in a row. The Huskies played late into the night in Berkeley Saturday, but they are a part of the national stage. Even if a relative few witnessed in person or on TV, Washington’s 66-27 triumph (box) left bruises on the Cal Bears, shudders among future opponents and checked boxes with the College Football Playoff committee that purportedly sees all, knows all. Dominant offense: 704 yards, 30 yards short of the school record. Check. Dominant defense: Cal’s 362 yards were 175 less than the Pac-12’s leading per-game average. Fifth-year senior QB Davis Webb needed 47 passes to get 287 yards, was intercepted three times in the third quarter and Cal was held to one of 14 on third downs. Check. 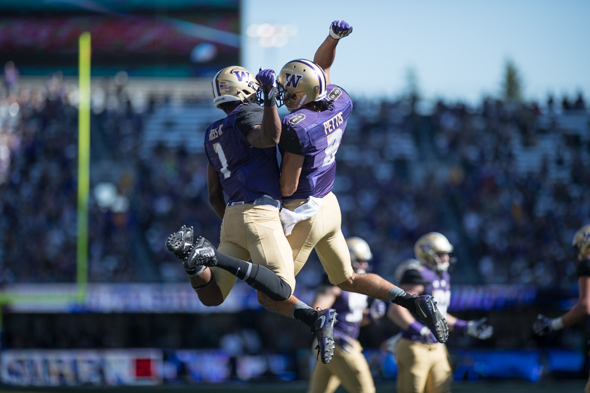 Game-breaking players: Three TD catches each for WRs John Ross and Dante Pettis, the latter also throwing a TD pass. Check. Resilience: After Cal closed to 21-20 in the second quarter and offered upset potential over the 17-point favorite, the Huskies ran off 38 points in a row. Check. Consistency: 12 wins in a row is the nation’s second-longest streak. Check. And they did it in November, the month when things go haywire in college football. Ask Texas A&M, which at No. 4 occupied the final spot in the CFP rankings that will determine the playoff field, one ahead of Washington. But the Aggies lost Saturday 35-28 to a Mississippi State team that was 3-5 entering the game. A second loss jettisons the Aggies from playoff consideration. “We made it to November, and we talked about it being kind of a new season,” said Huskies coach Chris Petersen. “You see it every week — a lot of things happen in this month that are strange. You don’t show up to play, bad things will happen. That wasn’t entirely apparent early, when the Huskies bolted to a 21-6 lead but let Webb bring the Bears back to 21-20 midway through the second quarter. That’s when Washington’s offense fully engaged. A six-play, 76-yard drive, which featured explosive pass plays to Pettis, TE Drew Sample and WR Chico McClatcher, climaxed with a six-yard pass to Ross for the final and least spectacular of his three TD receptions. Earlier, Ross twice blew past the injury-wracked Bears secondary for touchdowns of 60 and 67 yards, the second one a bewildering display of speed and quickness as he escaped six defenders. His elusiveness was mindful of the hero in a Jackie Chan movie. So did most everyone on the Huskies offense. Besides Ross finishing with a ridiculous 208 yards on six catches, Pettis had 104 on eight — the second time this season both exceeded 100 (also Oregon State) — the biggest chunks in a 417-yard passing day (including 39 yards from Pettis on a double-pass trickeration TD to TE Darrell Daniels). QB Jake Browning was 19 of 28 for 378 yards and six touchdowns that tied his own school record, and set a single-season record with 34. The 287 yards on the ground were led by third-string RB Lavon Coleman with 107 yards and a TD. The seven TD passes were a school record. The remarkable part is these gas-pump numbers were not dumped on an FCS school but a fellow conference member that came into the game 4-4, having beaten two teams ranked at the time — No. 11 Texas and No. 18 Utah. Remarkable as was the offense, the defense surprised even Petersen. Webb led the NCAA nation with 415 pass attempts but only eight interceptions, due largely to his quick release. But in the third quarter, the Huskies picked him three times, two by CB Sidney Jones. More astonishing was the 1-for-14 on third-down conversions. “We never saw that coming,” he said. “They’re good on third downs. They go for it a lot on third and fourth downs. We were nervous about that. But the defense stepped up on the money downs. The Bears had 100 yards in 27 attempts, a little more than half their average. Petersen will never acknowledge it, but the Huskies had to lay the wood to Cal because the team behind UW in the rankings is No. 6 Ohio State, which blasted No. 10 Nebraska 62-3 Saturday. The margin tied for the second-largest win in an Associated Press top-10 matchup in college football history. Temptation will be large on the committee to vault the Buckeyes, despite one defeat (a three-point loss to Penn State), over the Huskies, because of UW’s softer schedule. The Huskies also have to keep pedal to metal because USC (6-3), Washington’s next opponent, qualifies as the Pac-12’s second-hottest team after its fifth win in a row, this one 45-20 over Oregon. Also, No. 25 Washington State, the final-week opponent, filleted Arizona 69-7. The Huskies have to keep up appearances for the beauty pageant among college football’s beast-slayers. Those appearances will be on national TV Saturday morning, when ESPN’s celebrated “College Game Day” will arrive in Montlake. Hey, Seattle, What’s more remarkable: Hosting Monday Night Football in the same week as Game Day, or the Huskies scoring 66 points and the Cougars 69 on the same day? Enjoy the week at the center of the American football universe. Couldn’t ask for a better election distraction. Am SO lookinng forward to the USC game. The Trojans are currently the best team in the P12 South, record be damned. Fortunately, the game’s here in HS. Perhaps Sam Darnold will learn something like Marinovich learned in 1990. I hope Joe Mathis is back for this game, and that Azeem Victor is 100%. In a way, it’d be nice if the men of Troy were playing anything like they were at the beginning of the season, so we could do to them what ‘Bama did. But this ‘SC team is far different to the one in the first couple games. Darnold has really turned the Trojans around. They are always loaded, it’s just a matter of who the HC is, and Helton appears to be the right guy. This will be a tough game and yes, let’s hope Mathis is back, as our QB pressure has not been much the past 2 games without him. Not to forget WSU, who, given not only their record and coach, but the game is at WSU and the Apple Cup passion – I rate this as the toughest game of the year. I think the Apple Cup in Pullman will be very bit the chore that USC will be. Tougher. WSU has the over-the-top passion, SC does not. USC’s run game could give UW D some problems. UW D matches up well with WSU’s offense…really well if Mathis returns for that game. This being said, the spread of the AC will probably be similar to USC spread. Cougars have to get a healthy Falk to the final week. Which could be a problem, remember last year, Falk gets pounded in the games leading up to the AC, can’t play…. Darnold seems like a top-tier QB, but he hasn’t seen 4Qs of this kind of defense on the road. I don’t see the Trojans winning, but they did learn a few things watching how Utah’s D played vs. UW. I think Browning’s deep throws to Ross were underthrown by too much. I get the point that an underthrow at least gives the WR a chance to catch it, but both those long balls were touchdowns because the DBs were not good, and because Ross IS that good. Against USC, I think both of those could have been picked. It is very, very hard to overthrow John Ross on a streak or deep post, with any air under the ball at all. Out of curiousity, if Lavon Coleman is the third-string back, who is second-string?